A few months ago I wrote about a California Academy of Sciences meeting on incorporating citizen science into museums and science/technology center activities. There was a ton of good information provided and a lot of best practices exchanged by the participants. It was a great resource for project designers and researchers looking to increase their involvement with citizen scientists. I still highly recommend reviewing the proceedings for tips you can use in your own programs. An important item mentioned by during her presentation, and an item of particular interest for us, is a proposed series of participation categories for people amateurs involved in scientific research. It's mentioned briefly but deserves a much lengthier discussion. Contributory: Generally designed by scientists and for which members of the public primarily contribute data; also includes studies in which scientists analyze citizens' observations, such as those in journal and other records, whether or not those citizens are still alive. Collaborative: Generally designed by scientists for which members of the public contribute data but may also help to refine project design, analyze data, or disseminate findings. Co-created: Designed by scientists and members of the public working together and for which at least some of the public participants are actively involved in most or all steps of the scientific process; also includes research wholly conceived and implemented by amateur (non-professional) scientists. There is a lot of value in these categorizations and while I use slightly different ones, the concepts are solid. Not only do they accurately describe each person, but they are a useful model for different ways to engage and work with each type of citizen scientist. This sets everything up, but why a pyramid? Well, my previous research has shown that as the levels of complexity (or activity) increase, the number of available projects and number of people participating decreases. So the number of amateur scientists with expert, co-crated levels of activity are extremely rare...and they are shown at the pinnacle. Meanwhile the large number of other citizen scientists have lower levels of activity but are much more common...they make up a solid base. I also think it shows how everything still relies on basic contribution levels of activity. Even if someone wants to participate at a high level, they need many people collecting data and performing the initial analyses that they can build on for their expert level analysis. Distributed Computing: For the vast majority of users this just involves downloading onto a computer and pressing "Run". So I'd have to put it at the lowest level of involvement...Contributory. And it does contribute data (in the form of work-hours) to the project. But the person's involvement is extremely small leading me to categorize it in the Minimal category, below the Contributory level already at the base of the pyramid. Observational Measurement: In these projects scientists provide a collection of images or specimens for citizen scientists to measure, or provide specific tools for amateurs to use for measuring things they encounter on their own. So it can fit at the Contributory level for this first set of activities, up to the Collaborative where citizen scientists actively seek out their own data/specimens to measure. Observational Analysis: These are often identification projects that provide a set of data or images to identify. So it goes beyond mere measurement by having citizen scientists propose actual conclusions. In most cases these projects have all been Contributory in nature but future projects could extend into the Collaborative level as well. Transcription: This is very similar to observation measurement in that a project designer provides the raw material and the citizen scientists transcribes (or translates) the data. So this is a Contributory level of activity. Challenge: This one can run the gamut of involvement levels. It can involve designing a new rocket ship (Co-created), spotting a hard-to-find bird species (Contributory), or having your computer find a new prime number through distributed computing (Minimal). So we must place it in all levels of the pyramid. Game: Projects in this category often start at the Contributory level where people add little pieces to a larger puzzle in a game-like format. 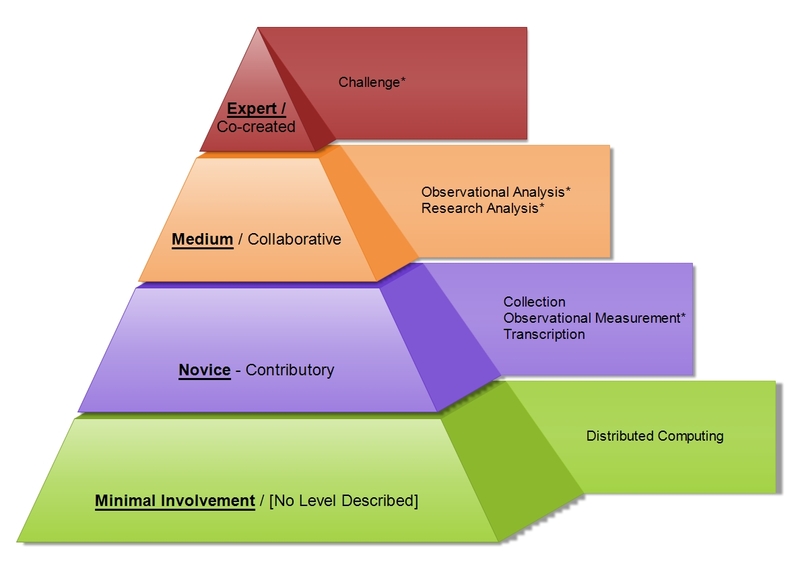 But many also involve teams and higher-level problems requiring extensive research, analysis, and effort. 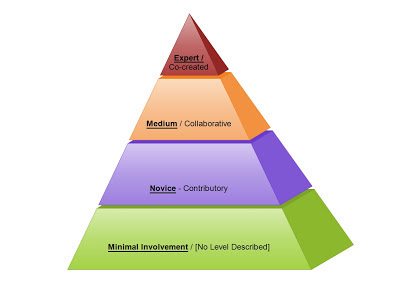 So it can also fit in the Collaborative pyramid level as well. Research Analysis: There is a fine line between this category, Observational Analysis, and Observational Measurement. But this is normally a more involved analysis that requires independent knowledge or research performed by the citizen scientist (Observational Measurement often requires comparison with known data provided by the project designer). So I consider this a Collaborative level of activity, though admittedly some could argue for higher or lower placement on the pyramid. Collection: Most examples of this have all been in the Contributory level, where the collection is the contribution making up a new data set. While this could be expanded and become a citizen scientists own project that asks others to collect large amounts of information for them, I don't know of any good examples yet. So it will remain in the first pyramid level for now. It's important to note that items in the "Expert" or "Co-created" categories are admittedly less defined. So far there are fewer projects and fewer people involved at those levels to fully describe them. I also don't think this area has "matured" enough to really pin things down. A lot can still develop with plenty of room for new innovations and developments. So it's an exciting field to watch and develop some early hypotheses, but precise definitions won't be available for some time. This is very useful information...but how can it help us? My next post will talk all about that and more...so Stay Tuned! Nice post. I have a paper in press for JRST and in the lit review we did something similar with the Contributory category. But instead of breaking into project types, we sub-categorized them into two groups: active vs. passive, based on the participant's contributory role. When it comes to designing the educational goals of a project, it's pretty important to recognize the role of the participant since it makes all the difference in the educational experience. Aaron - Thanks for the comment. I'm very interested to see the JRST article...the concept of active vs. passive is definitely underneath these concepts and key to understanding motivation as well. Passive is a good thing for many, with the key being how to move people to a more active experience. It is a good information and I like it! By the way, I have a good advice for you! It is the best online essay help for student! Wow, everything is written and analysed in a right way. Everything is quite clear.P.S. order Custom Research Paper online. Hello! Thanks for the information. The paper examines the prevailing mood of buyers and sellers, how market activity is trending worldwide, and how transactions in the upper levels of the market are completed. But if need professional help, click here for essay writing service. specially this post. I have bookmarked it and I am looking forward to reading new informative post like this. Thanks for sharing. visit our site to get technical support related to the lenovo device. 2 Line Friendship Shayari in Hindi, All relation we have are tie up with are birth, but only one relation in world is made by us, found by us, chosen by us, built by us, without anybdys recomnd and sugest, so frnd plz take care of your frnd for life time becoz its your own. Don't forget to promptly remove all stuffing from the turkey and either serve or refrigerate the stuffing in a separate container.